Honoring the life achievements of Martin Luther King Jr., Tidewater Community College annually recognizes three individuals who exemplify the civil rights leader’s dreams and goals. 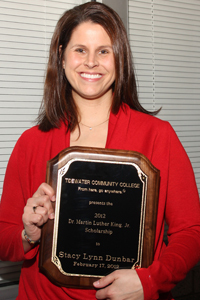 The 2012 winners received their awards and gave remarks about their lives and inspirations at TCC’s Martin Luther King college event on Feb. 17. In a nation and world increasingly dominated by media, Maurice A. Jones is uniquely qualified to meet Martin Luther King Jr.’s challenge of “remaining awake through great periods of social change.” In 2008 he became the first African American publisher in Landmark Media Enterprises history (a company founded in 1865) when he became publisher of The Virginian-Pilot. 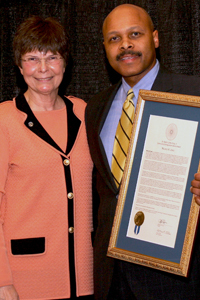 Jones previously served as commissioner of the Virginia Department of Social Services and as deputy chief-of-staff to former Virginia governor (now senator) Mark Warner. At the United States Treasury Department, Jones was special assistant to the general counsel and later legal counsel to the Community Development Financial Institutions fund. As an active member of the Hampton Roads community, Jones is a board member of the Crispus Attucks Cultural Center, the Children’s Hospital of the King’s Daughters, the Chrysler Museum of Art and the Virginia Arts Festival. Jones is also a board member of the Old Dominion University Educational Foundation and rector of Eastern Virginia Medical School’s Board of Visitors. Jones holds a bachelor’s degree from Hampden-Sydney College, a master’s from St. John’s College, Oxford University and a juris doctorate from University of Virginia School of Law. Following his path of public service, in September 2011, Jones was nominated by President Barack Obama for the position of deputy secretary of the United States Department of Housing and Urban Development. Well-known as a “counselor’s counselor” by students, faculty and staff at TCC, Wendy D. Buie is a mentor and leader whose role as lead counselor at the Virginia Beach Campus has affected many lives. As Coretta Scott King once stated, “Women, if the soul of the nation is to be saved, I believe that you must become its soul.” Buie lives that imperative. She is dedicated to helping others, to using humor to counsel, and to bringing a true sense of perspective to the art of counseling. A native of North Carolina, Buie began her career working as a teacher with disturbed and learning disabled children in a residential facility. She later became the first African American administrator at Salem College, a four-year private liberal arts college for women. During her tenure at Salem, her responsibility extended over seven states and three countries, and her recruitment efforts yielded traditional, international, minority and transfer students. Following her passion for helping students succeed, Buie joined TCC in 2001 as a disability provider/counselor at the Chesapeake Campus, becoming lead counselor and later transferring to the Virginia Beach Campus in that capacity. 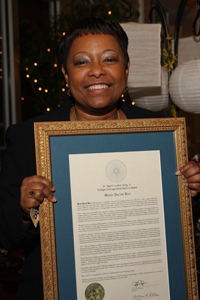 Beyond her dedication to TCC, Buie contributes her time to the American Heart Association, Multiple Sclerosis Society, March of Dimes, Sickle Cell Anemia Association and other organizations. She is a member of Calvary Revival Church and is involved in extensive ministries. Buie holds a master’s in agency counseling from North Carolina Agricultural and Technical State University. A straight-A student in the diagnostic medical sonography program at the Virginia Beach Campus, Stacy Lynn Dunbar goes beyond daily work and studies. A member of Phi Theta Kappa-Psi Upsilon, she volunteers for the Food Bank and takes part in fund-raising events such as a 10k “mud run” for research against multiple sclerosis. With fellow church members she also established a ministry called Tabitha’s backpack to provide food for hungry children.